The structure of an azo compound known as yellow azo dye. Azo compounds are chemical compounds with the general formula R-N=N-R', where R and R' can be either aryl (aromatic) or alkyl (aliphatic) functional groups. The N=N group is called an azo group, although the parent compound, HNNH, is called diimide. The more stable azo compounds contain two aryl groups. Azo compounds with alkyl functional groups are particularly unstable and should be handled with care, to prevent them from exploding. Methyl red, an azo dye, turns red in acidic solutions. Aryl azo compounds have vivid colors, especially reds, oranges, and yellows. They are therefore used as dyes and are classified as azo dyes. Examples include methyl red and Disperse Orange 1. The ability to manufacture azo dyes was an important step in the development of the chemical industry. The name azo comes from azote, the French name for nitrogen, which is derived from the Greek a (not) + zoe (to live). As noted above, aryl azo compounds are brightly colored and are useful as dyes and pigments. In chemical terms, their colors are attributed to delocalization of п (pi) electrons. Some azo compounds, such as methyl orange and methyl red, are used as acid-base indicators because their acid and salt forms have different colors. Methyl red is red at pH below 4.4, yellow at pH over 6.2, and orange in between. Azo pigments are colorless particles (typically earths or clays) that have been colored using azo compounds. Azo pigments are important in a variety of paints, including artist's paints. They have excellent coloring properties, again mainly in the yellow to red range, as well as lightfastness (that is, colorfast when exposed to light). The lightfastness depends not only on the properties of the organic azo compound, but also on the way they have been adsorbed on the pigment carrier. Azo pigments are advantageous because they are non-toxic. Azobenzene is the prototypical aryl azo compound. Aryl azo compounds are usually stable, crystalline species. Azobenzene is the prototypical aromatic azo compound. It exists mainly as the trans isomer, but upon photolysis, converts to the cis isomer. Aromatic azo compounds can be synthesized by using an azo coupling reaction, which entails an electrophilic substitution reaction where a aryl diazonium cation attacks another aryl ring, especially those substituted with electron-releasing groups. Since diazonium salts are often unstable near room temperature, the azo coupling reactions are typically conducted near ice temperatures. The oxidation of hydrazines (R-NH-NH-R') also gives azo compounds. Azobisisobutylonitrile is used as a radical initiator in the preparation of polymers. Aliphatic azo compounds (R and/or R' = aliphatic) are less commonly encountered than the aryl azo compounds. One example is diethyldiazene, EtN=NEt. At elevated temperatures or upon irradiation, the carbon-nitrogen (C-N) bonds in certain alkyl azo compounds cleave with the loss of nitrogen gas to generate radicals. Owing to this process, some aliphatic azo compounds are utilized as radical initiators. 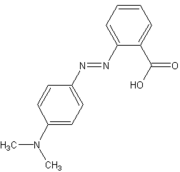 Representative is azobisisobutylonitrile (AIBN) which is widely used as an initiator in polymerization. Because of their instability, especially for aliphatic ones, care should be taken with the handling of azo compounds or an explosion may occur. ↑ H.T. Clarke and W. R. Kirner, 1941, Methyl Red, Org. Synth., Coll. Vol. 1: 374. Retrieved January 8, 2009. ↑ Jerry March, Advanced Organic Chemistry, 4th ed. (New York: Wiley, 1992, ISBN 0471601802). ↑ R. Ohme, H. Preuschhof, and H.-U. Heyne, 1988, Azoethane, Org. Synth., Coll. Vol. 6: 78. Retrieved January 8, 2009. Clarke, H. T., and W. R. Kirner. 1941. Methyl Red. Org. Synth. Coll. Vol. 1: 374. Retrieved January 8, 2009. Delamare, François, and Bernard Guineau. 2000. Colors: The Story of Dyes and Pigments. New York: Harry N. Abrams. ISBN 0810928728. March, Jerry. 1992. Advanced Organic Chemistry: Reactions, Mechanisms, and Structure, 4th ed. New York: Wiley. ISBN 0471601802. This page was last modified on 5 May 2016, at 14:17.